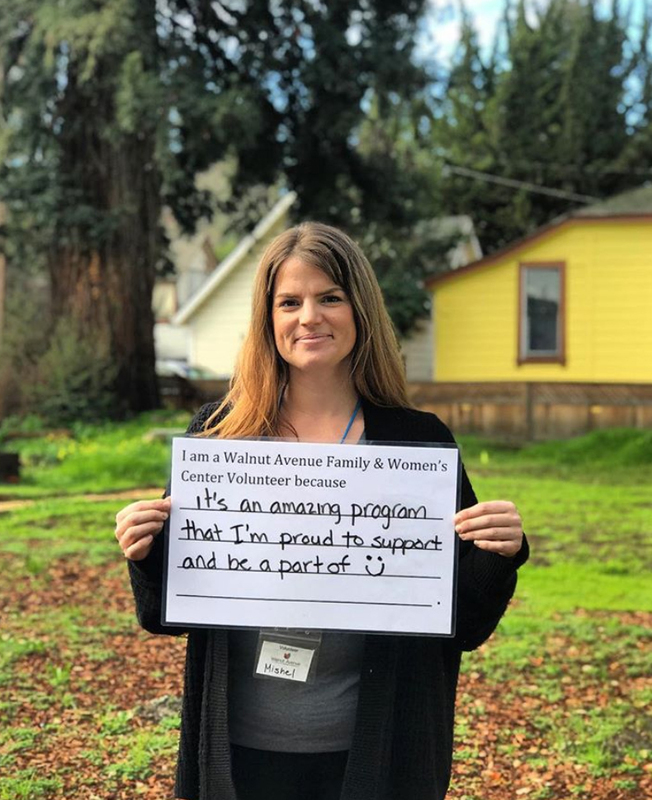 Thank you for your interest in volunteering at Walnut Avenue Family & Women’s Center (Walnut Avenue) where our mission is to provide support and services to women, children and families so they have the opportunities and skills to thrive. There are many programs in which to volunteer your time. Walnut Avenue has four core programs and there are volunteer opportunities in all of our programs. PLEASE NOTE: If you are under the age of 18 please stop by our office to pick up a parental consent form and instructions on the application process for minors. The volunteer positions open to minors are in our Early Childhood Education (ECE) program. Minors do not attend the general volunteer orientation. 1. ORIENTATION: To sign up call 831-426-3062 and tell the receptionist you would like to sign up for a volunteer orientation. 3. APPLICATION: Complete the paperwork that you receive at the volunteer orientation. 4. MEET WITH COMMUNITY ENGAGEMENT COORDINATOR: Call 831-426-3062 to schedule a meeting with the Coordinator. If you have selected a program or volunteer opportunity that requires you to get fingerprinted or get a TB test/full immunization, please complete those steps prior to scheduling your meeting with the volunteer coordinator. 5. TRAINING: Training requirements depend on the program selected for your volunteer/intern commitment. 6. COMMITMENT: Particular programs do have minimum time commitment requirements but we are happy to work with volunteers on creating short and long term volunteer opportunities. This may sound like a long process but because of the nature of our services, it is necessary for us to know as much about you as possible and prepare you for your volunteer work with our participants. Walnut Avenue Family & Women's Center has more volunteers than paid staff. We simply could not begin to serve all of the participants who walk through our door without a strong, committed volunteer base. Volunteer and internship opportunities are part of our Community Engagement Program within our Resource Development Department. The Resource Development Department includes Community Engagement and Family Support Services.